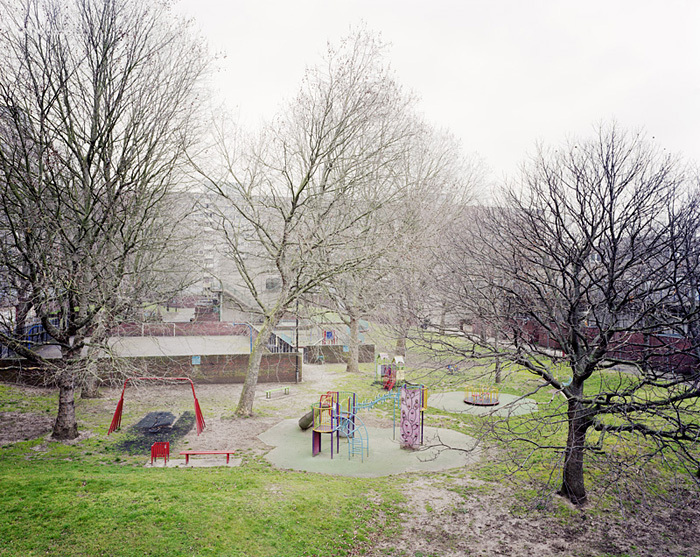 These images were from my exhibition, Heygate Abstracted. 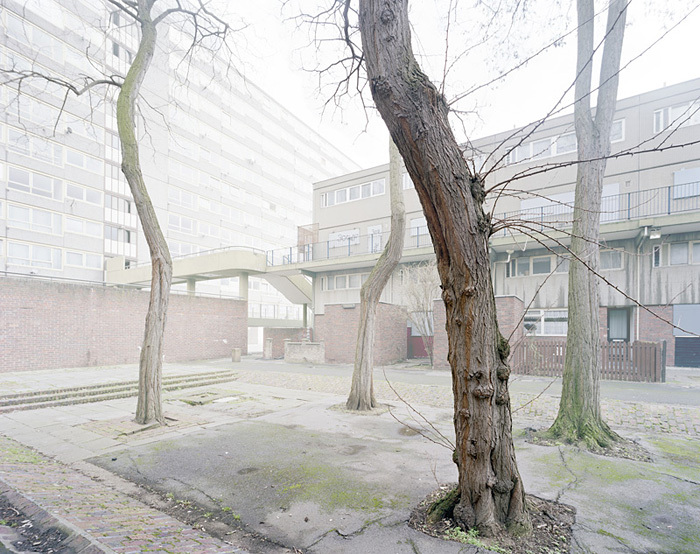 “635 x 508: Heygate Abstracted. 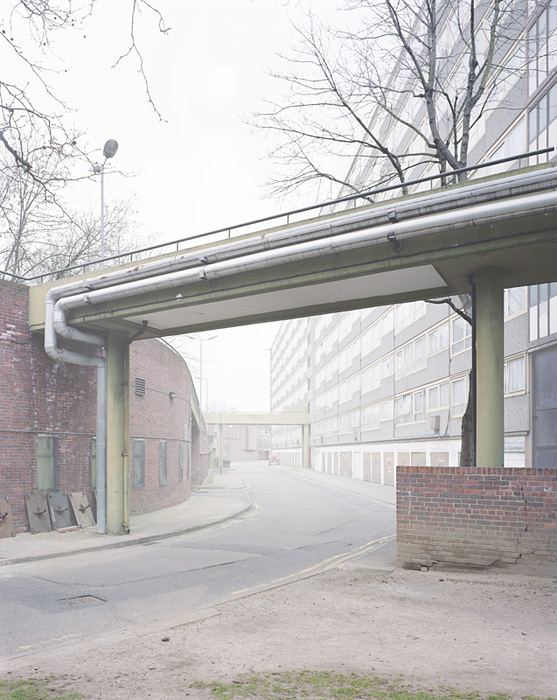 The Heygate Estate in South London was completed in 1974. 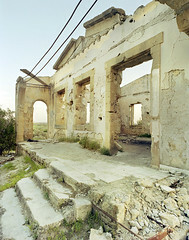 The estate now stands empty and awaiting demolition. 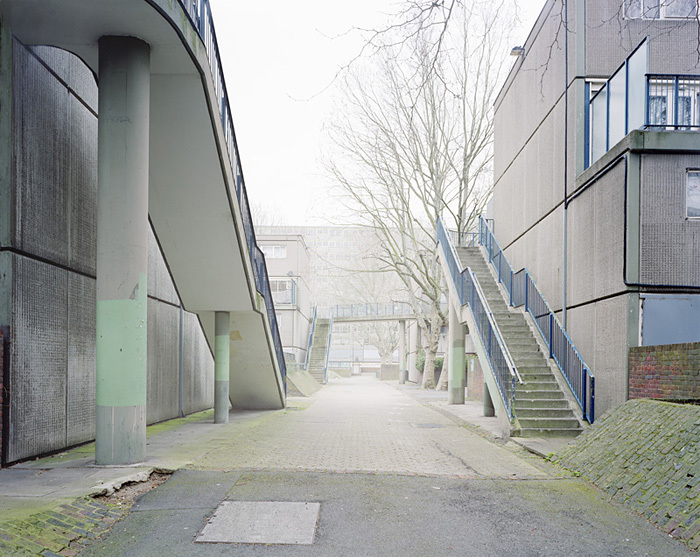 635 x 508: Heygate Abstracted is a photographic installation, a result of numerous visits to the estate through 2010. 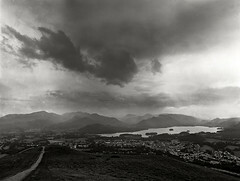 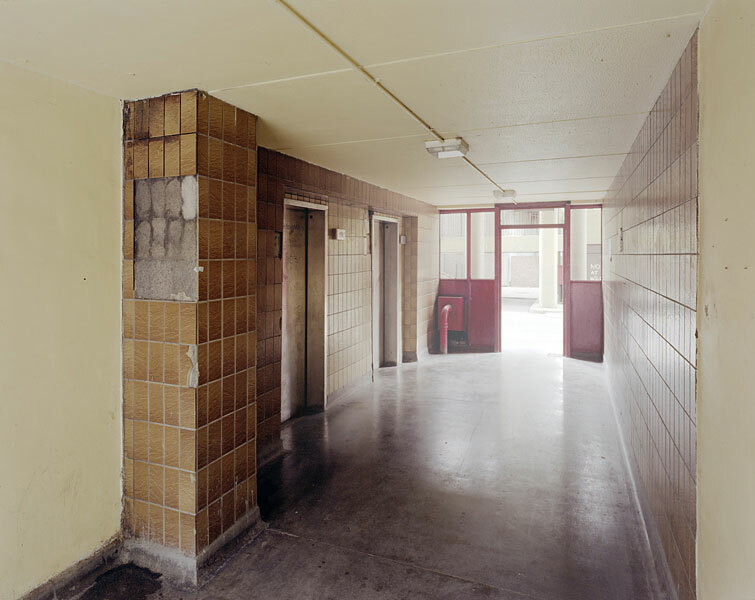 A large format camera was used to photograph and re-photograph specific views and locations around the public areas of the estate. 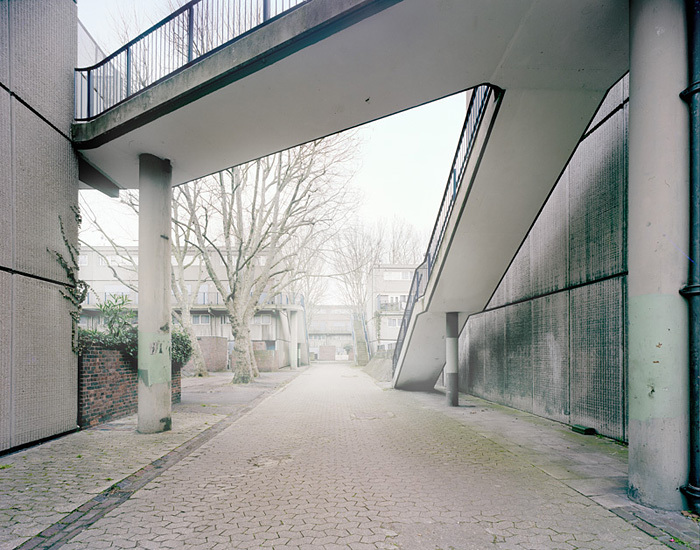 Simon Kennedy’s photographs of the Heygate Estate prompt us to contemplate not the failure of modernism, but the failure of the failure of modernism, and the possibilities for reclaiming a mode of Utopian urban thinking. 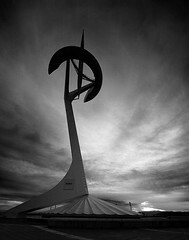 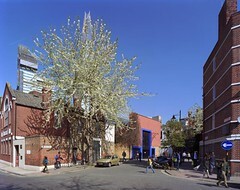 In doing so they provide a visual elaboration of a prominent theme in contemporary architectural debate. 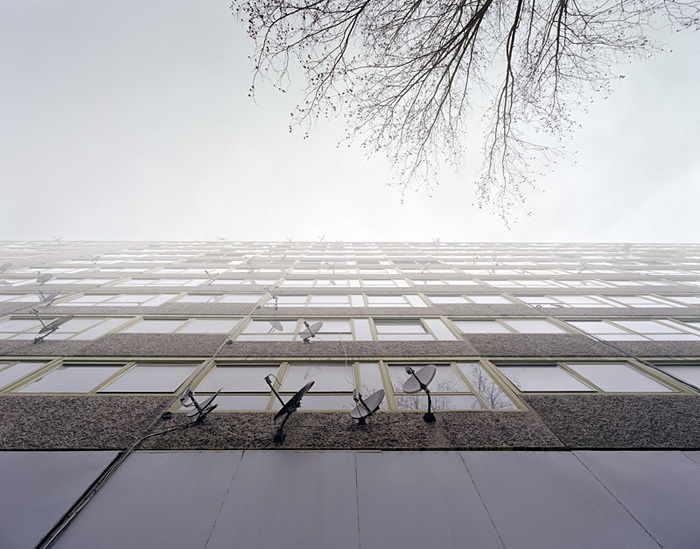 At a time of acute shortage of affordable housing, the photographs make us question the validity of the decision by Southwark Council to demolish these buildings—are they essentially and irretrievably a failure? 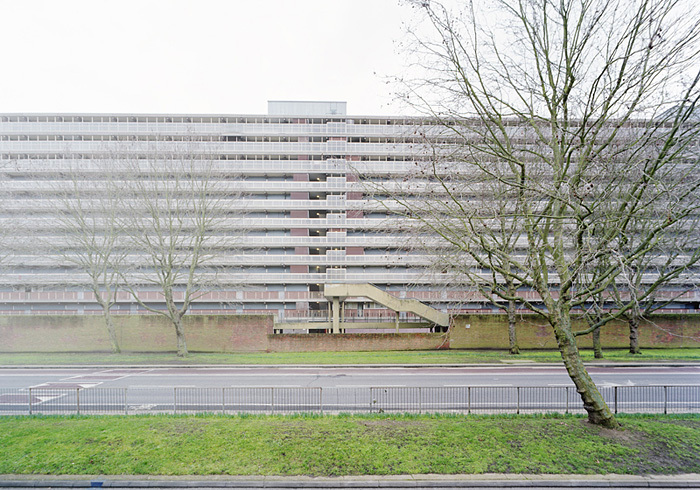 In their guide to the architecture of south London Bridget Cherry and Nikolaus Pevsner struggle to make sense of the estate, built between 1968 and 1974. 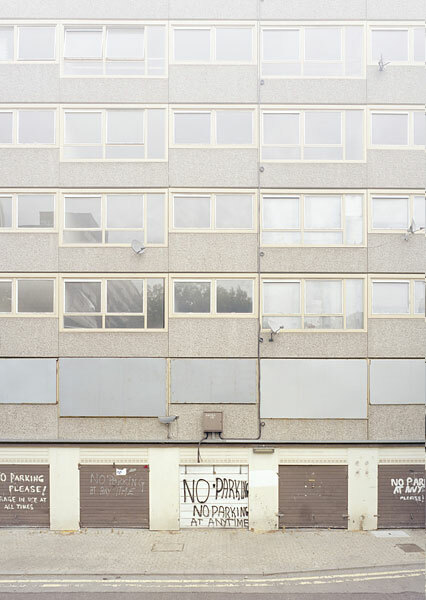 Clearly impressed by the visual impact of its slabs and the gargantuan social ambition of the London Borough of Southwark Architects’ scheme, they also categorize the Heygate as one of ‘the most notorious products of industrialized building’. 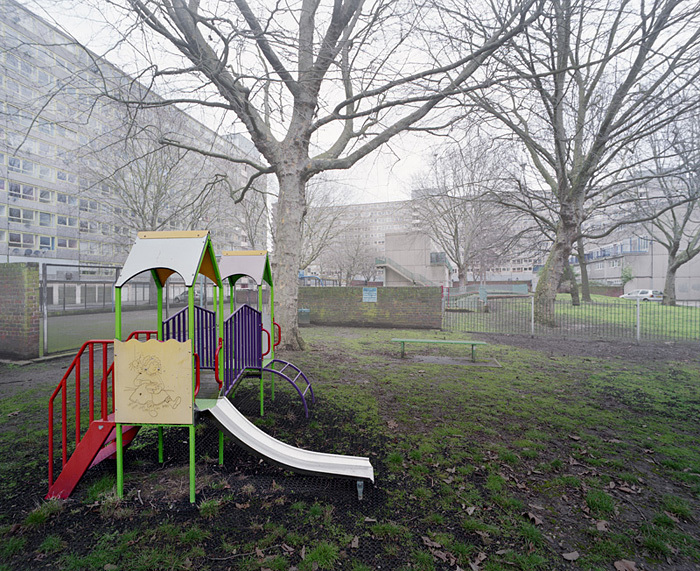 Few London locales have become so linked with postwar ‘modernism in ruins’ as the Elephant and Castle, a neighbourhood long stigmatized through an iconography of material and social ‘blight’ and ‘brutality’, an inner-city intersection with a vast stock of council housing, the physical deterioration of which attests to its being mostly by-passed, along with the area’s residents, by the wealth circulating in the late modern London. 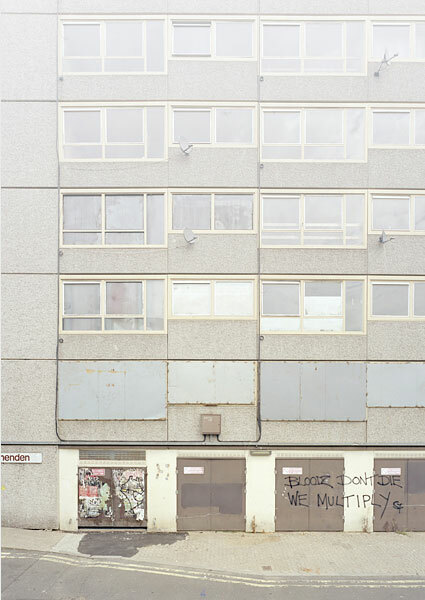 Kennedy’s photographs emphasize the consequences of the painfully protracted if not perpetual contemporary ‘regeneration’ process which has left homes and shops conspicuously vacant for years on end. 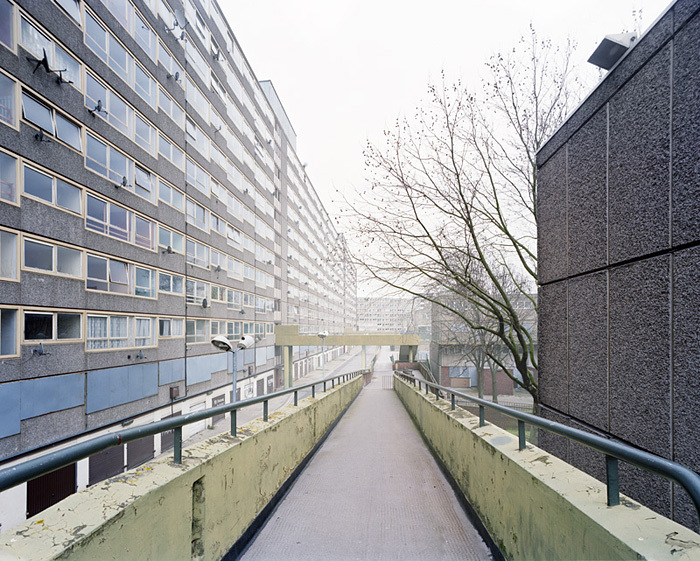 They show an urban landscape of quasi-ruins, attractive to photographers and journalists through the spectacle of ‘sink’, to use the term Tony Blair problematically applied to the Heygate’s sister Aylesbury Estate, PR birthplace of New Labour government. 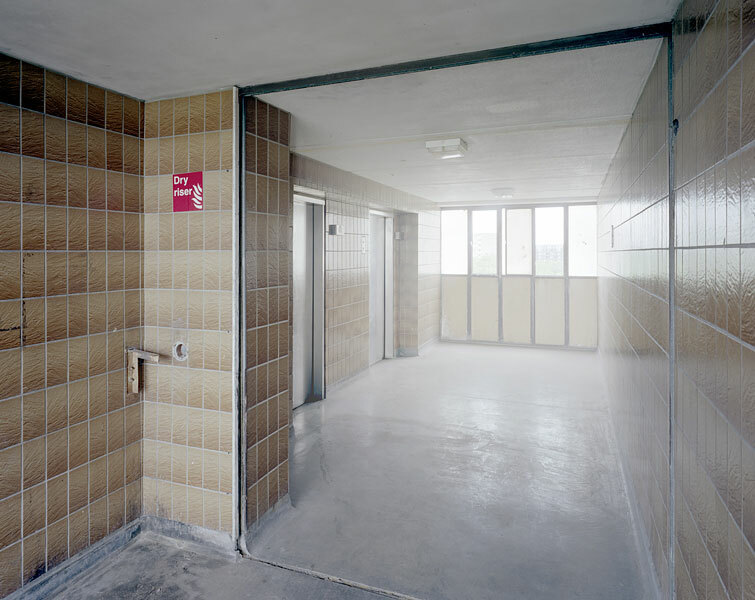 Trained as an architect, Kennedy’s gaze fixes on the formal qualities of the estate’s exteriors and public spaces, selecting architectural moments, abstracting views and elevations, in a process that disassociates these buildings from their contentious histories, and any sense of domestic life. 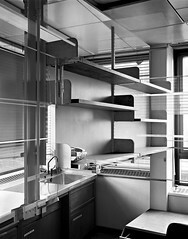 The result is that the photos capture something of the essence of the original blueprints. 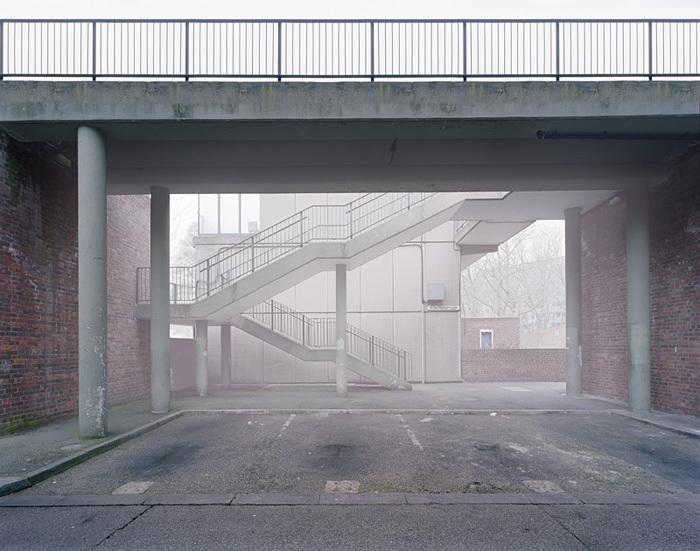 Yet an air of pathos pervades, emptiness is the striking feature of this catalogue of intended social spaces. 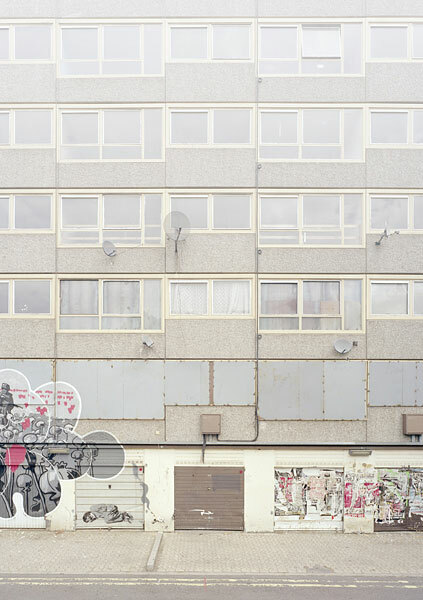 These qualities have particular resonance now, of course, at a time of accelerated state withdrawal from housing provision, and changes to housing benefit policy that will force those on low-incomes towards the periphery of the city. 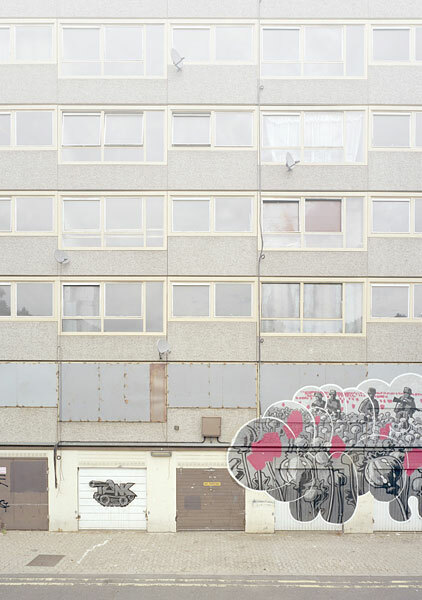 Owen Hatherley, Militant Modernism, Winchest and Washington, Zero Books, 2008, p. 13. 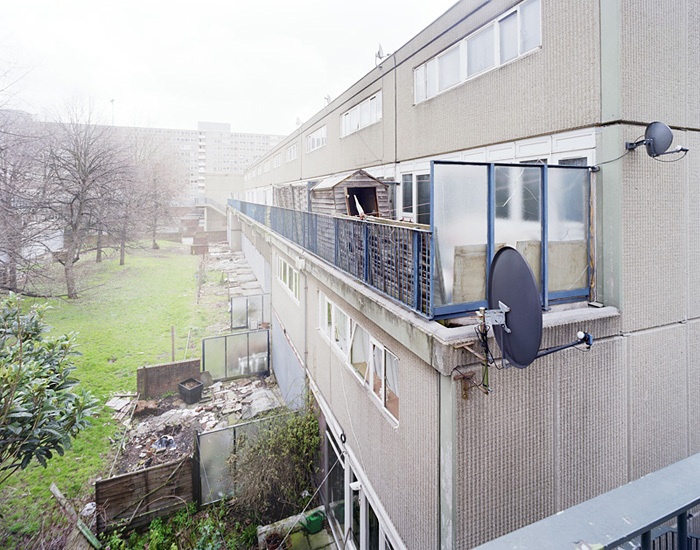 Completed in 1974 the Heygate Estate in South London typified the Utopian aspirations of many post-war housing schemes. 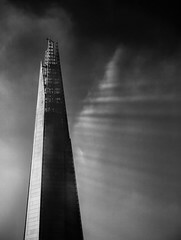 It was large, ambitious and its orthogonal geometries imposed themselves on the older contours of the Elephant and Castle in an attempt to create something ‘better’. 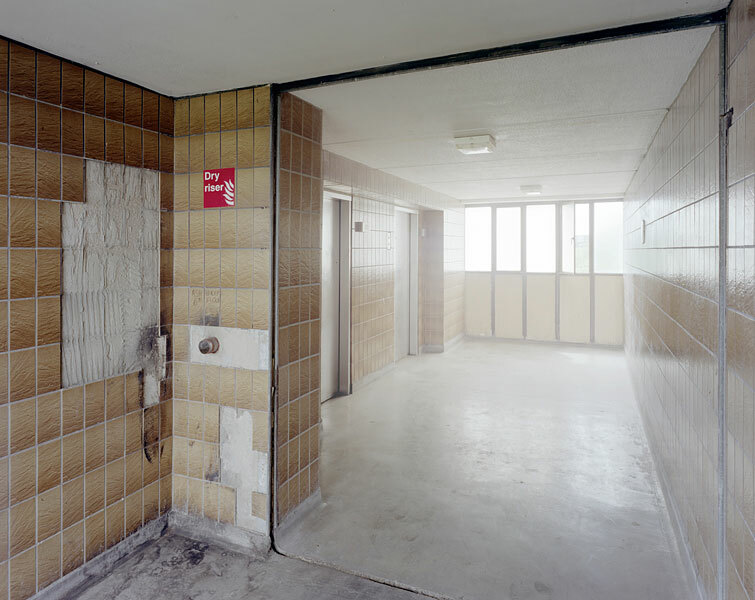 However, through a combination of physical neglect and poor social and political administration the Heygate is now empty and awaiting demolition; its only use is as a setting for films and TV shows highlighting inner city crime and deprivation. 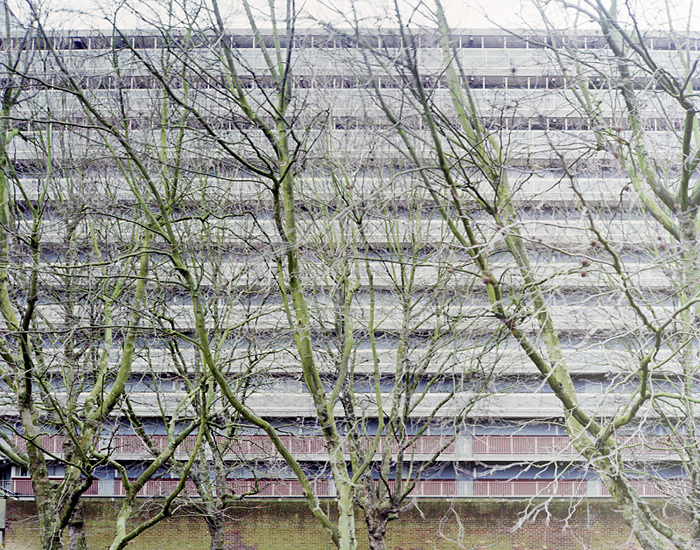 The Heygate, which had once been a model for a new future, is now held as a potent symbol of the failed ambitions of the wider ‘Modernist’ project. 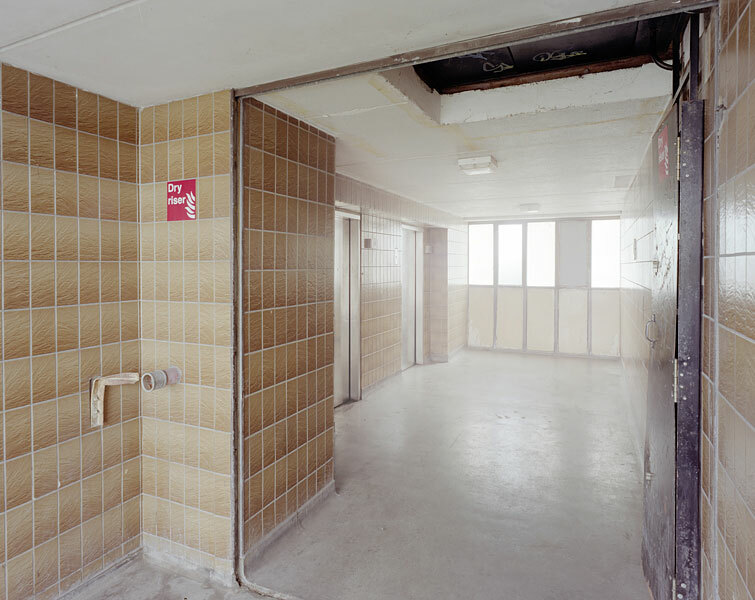 Simon Kennedy is an architect, film-maker and photographer, he has been visiting the Heygate for over a year photographing the empty and abandoned spaces not as a form of social documentary but as an experiment in photography as architecture, using the camera and the processes of post-production to generate new spatial concepts. 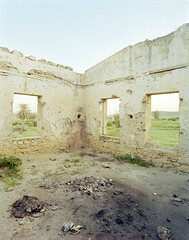 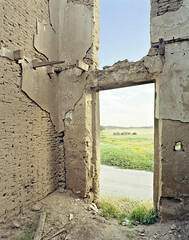 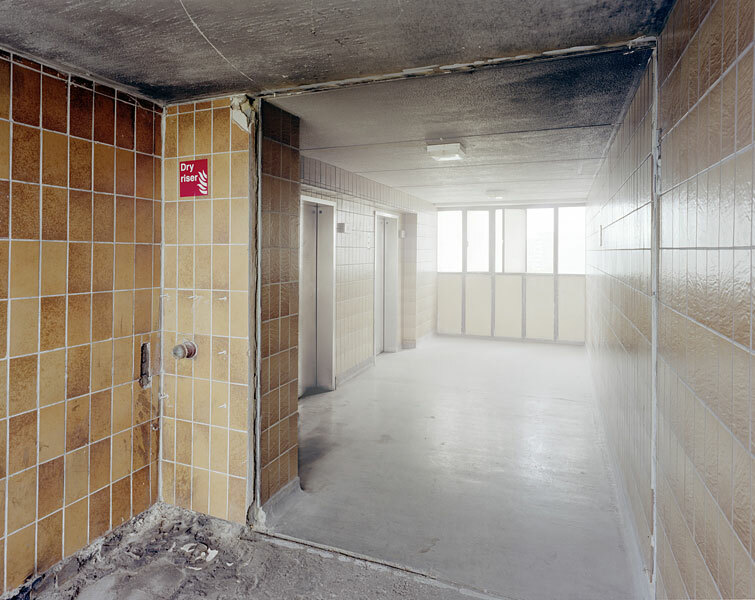 Kennedy’s photographs are not merely representations of an existing space but an attempt to create alternative spatial possibilities out of an existing architectural site. 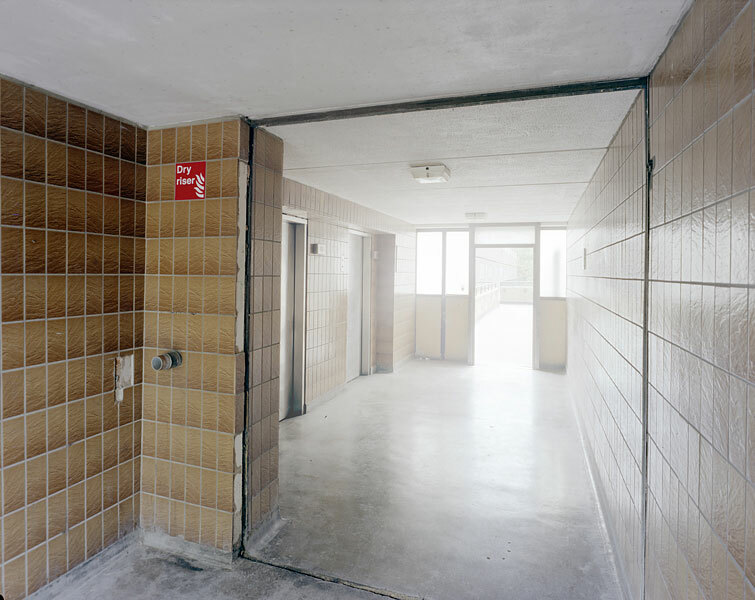 To generate these photographs Kennedy returned to the site many times, continually refining the photographic series, at first using a range of digital cameras taking hundreds if not thousands of shots. 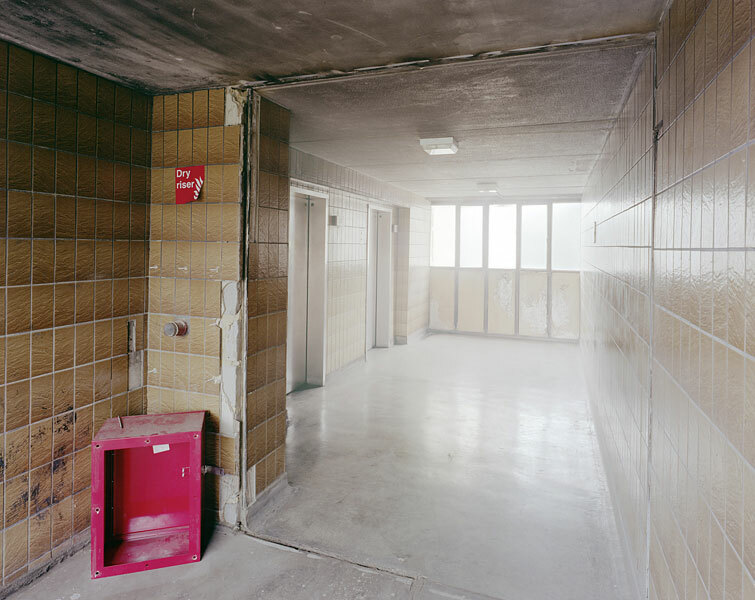 Then through a process of critical editing the themes and forms of final series emerged and Kennedy moved to a large format film camera. 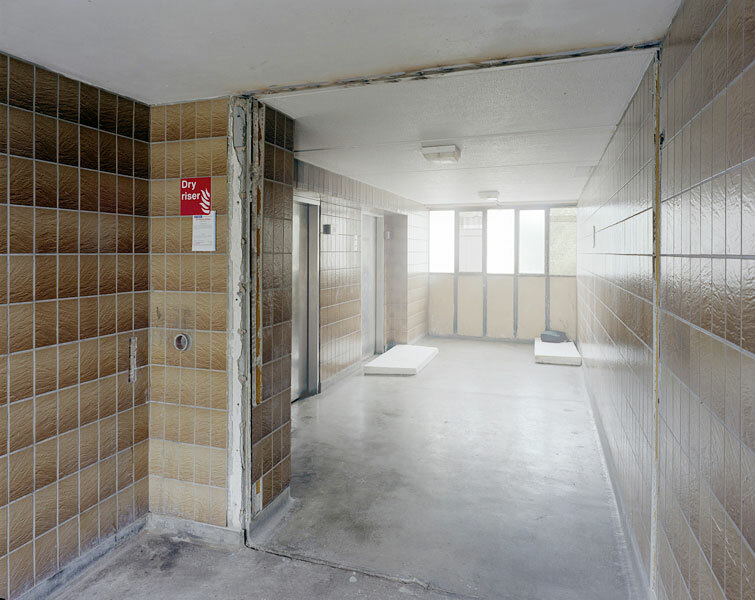 This process continued albeit at a much slower and more considered pace until the final sequence was obtained. 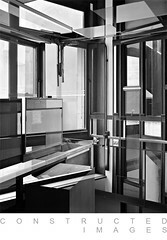 Once captured the process was still far from complete, the images were digitally scanned then subtly manipulated in the computer to construct the characteristics of the new spaces. 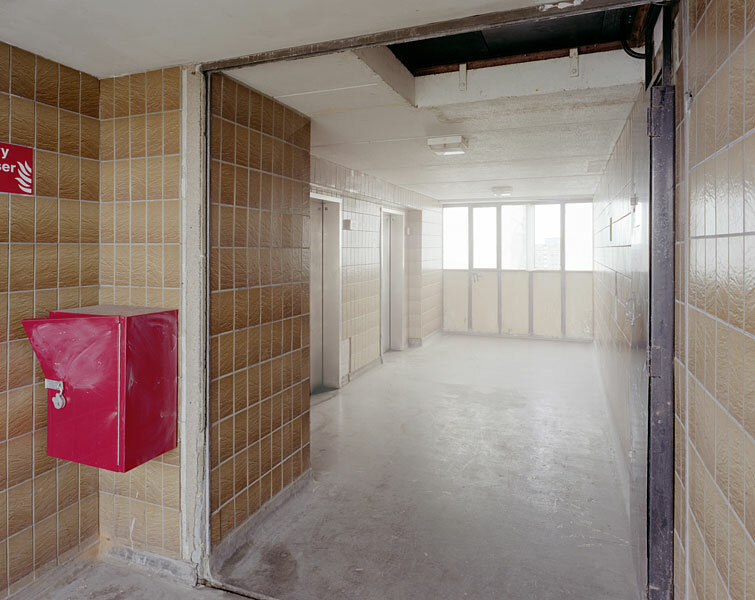 The images were cropped and formatted, the colours were subtly graded, extraneous features removed, forms manipulated and the mist that washes through the images was introduced. 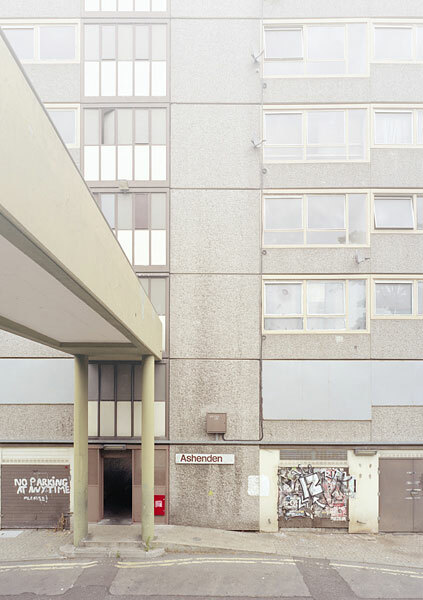 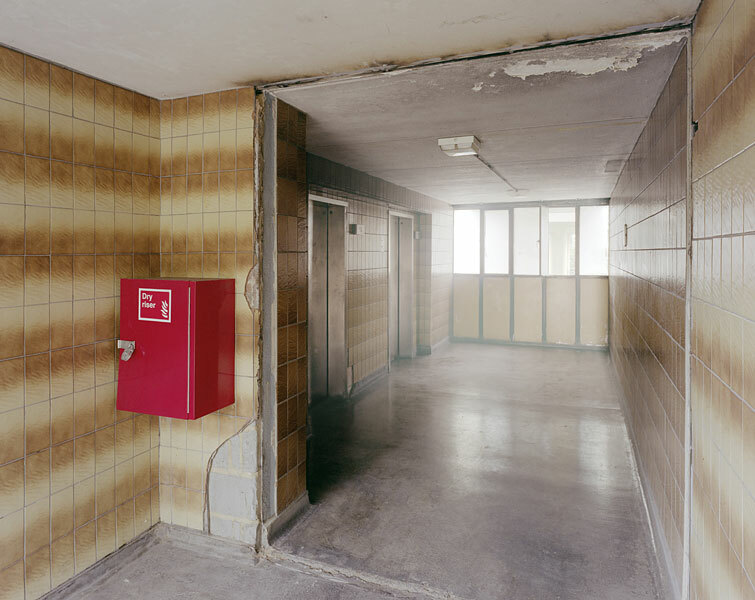 Kennedy’s photographs are not intended to be sentimental, they do not mourn the failures of post-war social housing and they are not photographs about the Heygate as ‘place’, in many ways the physical architecture is seen as simply supplying convenient forms that are re-organized and reduced to abstract compositions. 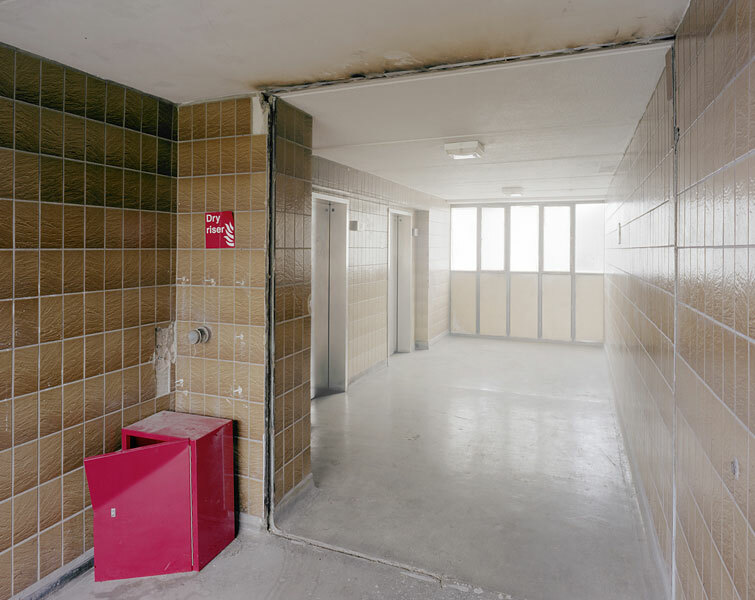 The architectural elements of the Heygate Estate lose their ‘functionality’ becoming planes and surfaces exposing the underlying abstractions of the original architectural project. 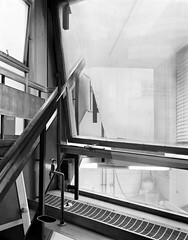 If the abstract language of Modernism started in the squares of Russian Suprematism and found its architectural articulation in the hard forms and grids of Constructivism and the International Style, in Kennedy’s augmented photographs the physical spaces of ‘modern’ architecture are returned to abstraction via the photographic image, but these spaces are not alone, other forms are also present and their presence seeks to fatally disrupt the ‘pure’ geometries of the architecture. 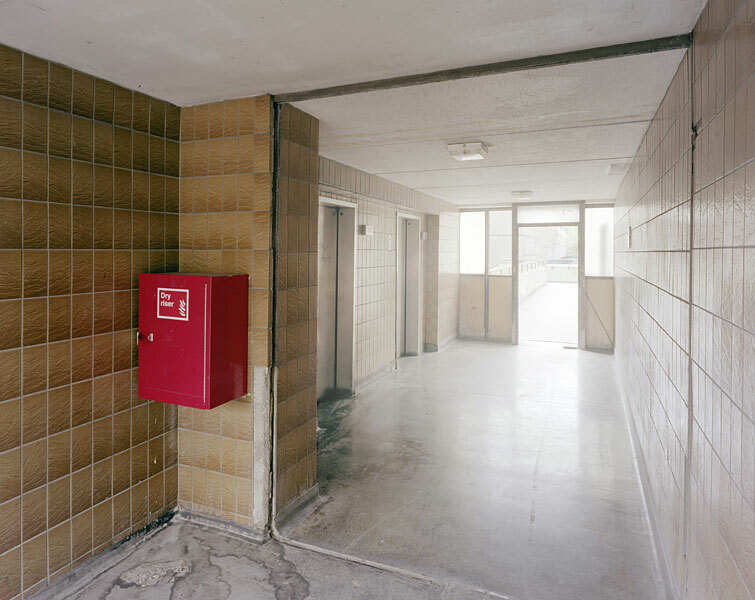 The term ‘unheimlich’ has become something of a cliché in architectural writing and although this series of photographs literally deals with a site that has lost its ‘homeliness’ it is not the change in programme that gives the photographs their uncanny nature, it is the presence of a new set of tenants, the trees. 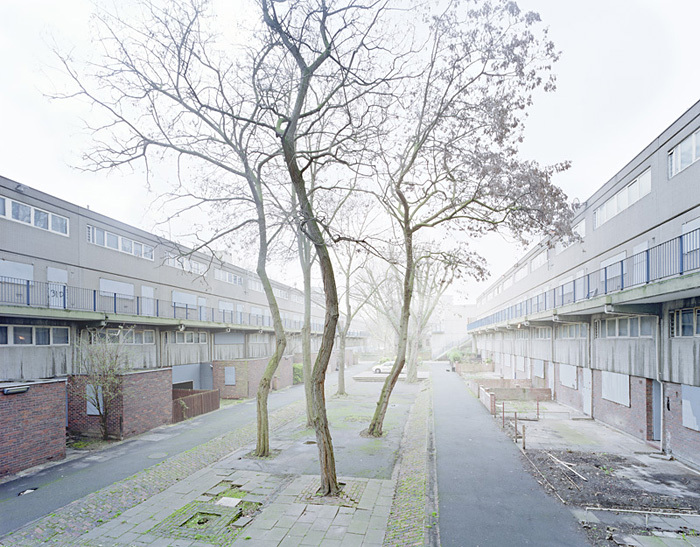 As the tenants of this world the tree, representing nature, is not seen as benign but as an invading force, alien and ‘unnatural’. 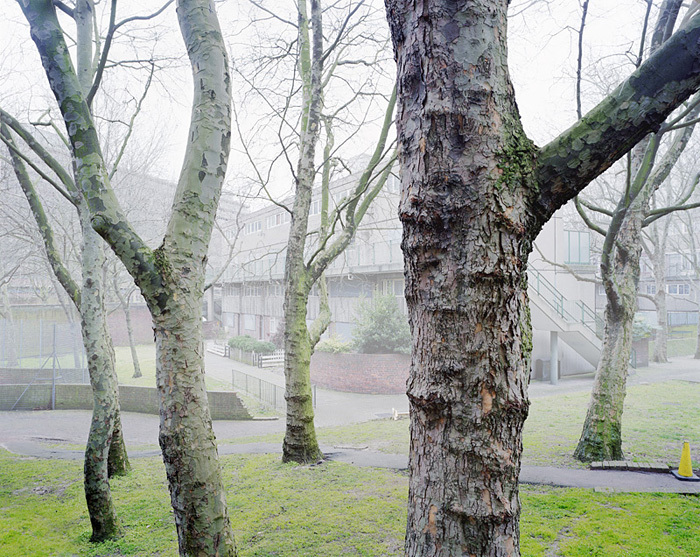 In the photographs the geometries of the trees jar against the ordered orthogonal shapes of the Heygate itself. 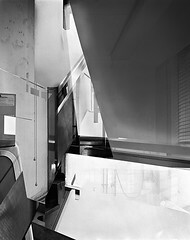 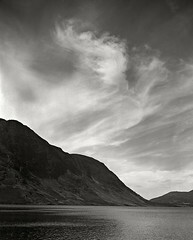 If modernism sought to exclude nature through abstraction then it was this that was ultimately impossible to achieve as nature will always find a way back, Kennedy’s re-imagined spaces capture a world where the normal inversion of artifice and nature is overturned, and it is modernism that is the victim of a rampant and savage naturalism.